If there is one thing you love about this town, it’s the traffic. Okay, maybe not. So here’s a little something to make it less brutal. 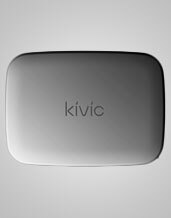 Meet Kivic One, a clever device that wirelessly streams music and video from your phone to your car stereo, available online now. This does exactly what you think it does—it takes all the songs, movies and Internet-y goodness on your phone, and lets you play it through your car. Playlists. Pandora. YouTube. All of it. And if you’re thinking, “Hey, I can do all of this already,” here’s the novelty—it lets you do all this wirelessly. The advantages are obvious. No messing with wires when you get in and out of your vehicle. Having access to Purple Rain at all times. Streaming your short-film remake of White Men Can’t Jump on your display monitor. Hey, someone should enjoy sitting in a traffic jam.